The Monroe County Recycling Center (MCRC) is located on Lee Road and was opened in 1992 to accept curbside residential recyclables. Materials delivered to the facility are sorted, processed and baled for transport to end market users. Every day, approximately 200 tons of valuable materials are extracted from the waste stream and redirected into the supply chain through recycling at the MCRC. The Recycling Center currently receives about 40,000 tons of curbside recyclable material per year. The operation of this facility has been by private contractor solicited through a request for proposals issued by the county every ten years. On January 1, 2013, Waste Management, Inc. began operating the Recycling Center under a ten-year contract. The MCRC was upgraded from a dual stream (paper and containers were collected and processed separately) to a single-stream or Mixed Recycling (paper and containers mixed together) processing facility in 2014. Mixed Recycling provides a higher level of efficiency in collection and processing, thus reducing cost and environmental impact. Because it is convenient for residents, Mixed Recycling can often lead to increased participation in recycling. 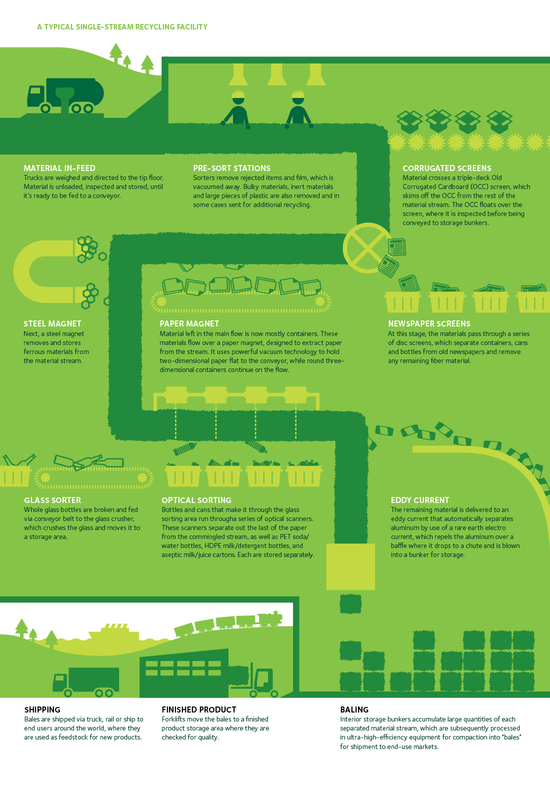 How are curbside recyclables processed? The Recycling Facility is designed to efficiently sort recyclable materials by type: paper, plastic, metal, and glass. Mixed Recycling machinery employs advanced technologies including magnets, screens, and eddy currents to automate and maximize the sorting of recyclables. There are also a number of hand sorters (people) who ensure the high quality of recyclables at the MCRC. Follow the process in the graphic here.